The U.S. military has standardized the way individual equipment is carried by a soldier. The main purpose was to keep the weight down. Since this is a very common system there are a number of manufacturers making ALICE compatible equipment. ALICE is a Vietnam era system. 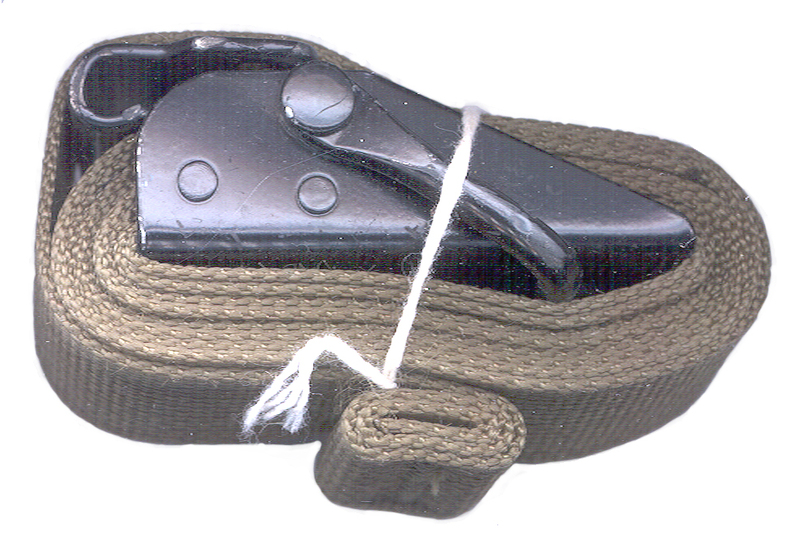 The W.W. II system used bent heavy gauge wire to attach a canteen to a pistol belt. MOdular Lightweight Load-carryng Equipment (MOLLE) is the new system that's now being fielded. With this page I'm trying to collect just the official government issue items and related information. The Links section below has some vendors of compatible equipment that may or may not contain Government Issue items. Carrying a load by using shoulder straps puts the weight of the load on all of the spine from the shoulders on down. This is both tiring and potentially causing back problems. A much better way to carry a load is to use a belt that's snug enough so that it can not slip past the hips and that also supports a rigid pack frame. Now the weight is supported by the belt. In this arrangement the shoulder straps are not carrying the weight, but rather are there to keep the load from falling backward. "MOLLE system was supplied to USMC by a single contractor [Specialty Defense Systems] in 1988, the same contractor supplied the MOLLE II upgrades in 2000. These systems were supplied with care & use manuals by the contractor. The same thing is happening with the replacement system ILBE [Improved Load Bearing Equipment - 2004] which replaces the packs & other deficient items but continues to use MOLLE pouches. 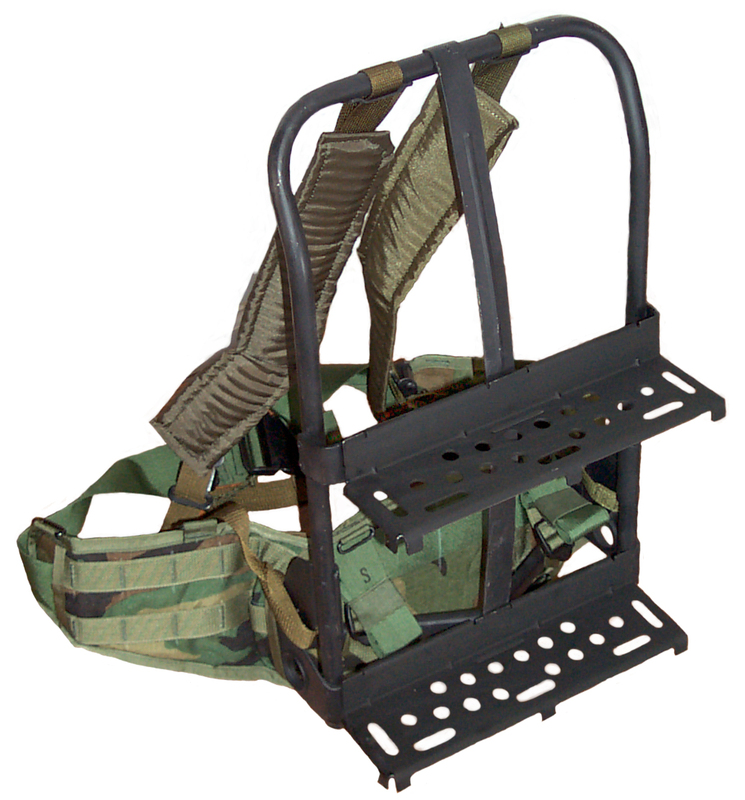 MOLLE is miss identified with PALS [Pouch Attachment Ladder System] which the MOLLE system uses, the army first used PALS in 1988 with the SPEAR system issued to Special Forces personnel. 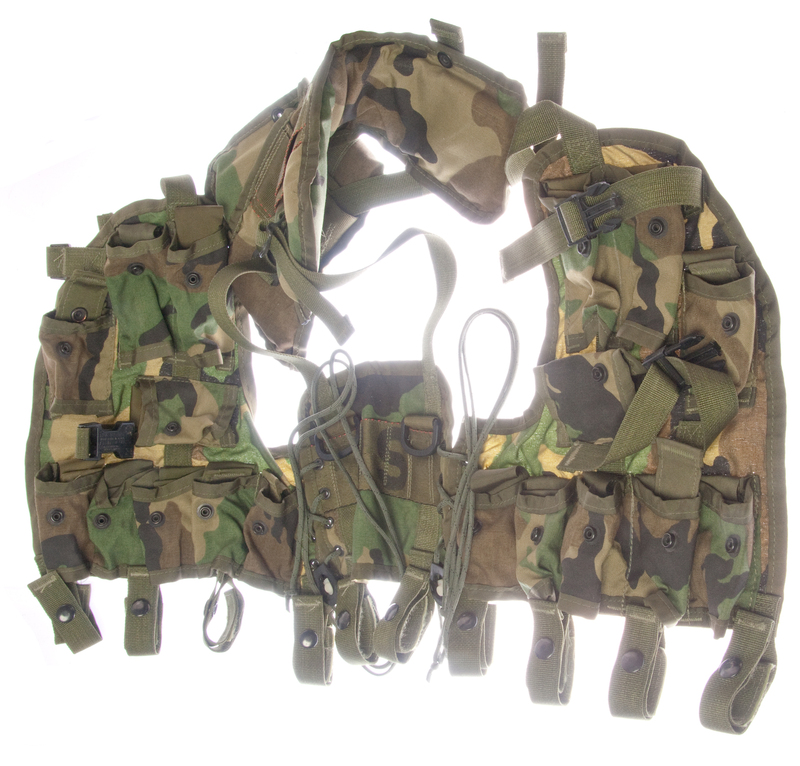 PALS was a requirement on the Interceptor Body Armor and items were approved for unit purchase and received NSNs. Because of The superiority of this gear the army is slowly replacing the LC1/LC2, SPEAR, & IIFS [Integrated Individual Fighting System] gear with a MOLLE system but has a mish mash of items from various contractors, thus no official field manual. 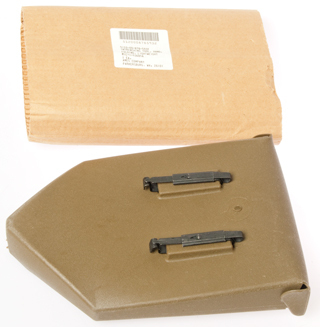 Alice gear evolved from M1967 MLCE [Modernized Load Carrying Equipment] with only the magazine pouches for 30 rd mags carried over as ALICE LC1 all other items were upgraded or changed. 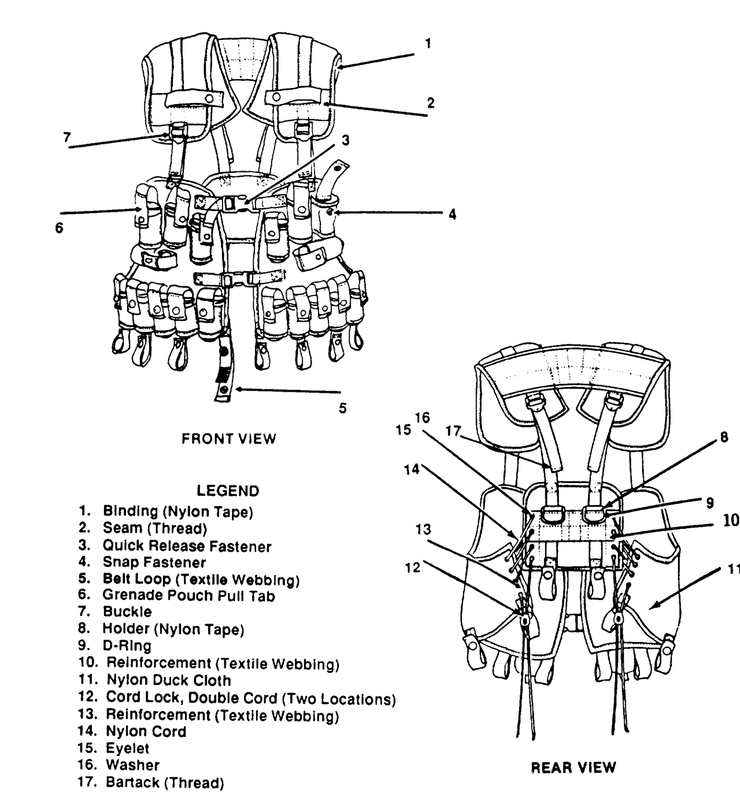 LC2/LC3 are upgrades of LC1 with no obvious changes to the gear in most cases, H suspenders LC3 are just M1967 MLCE. Some gear add to inventory such as individual First Aid Kit received the LC2 designation. Because of commercial marketing the lines between these systems and upgrades is quite confusing." "LC-1 is the first production pattern of any particular ALICE kit, and LC-2 is a later improvement – such as the LC-2 pistol belt that was adopted in 1981. However, please note that everything from M-1956 pattern LCE on forward (the 1967 MLCE, the 1972 ALICE, the 1990’s LBV, etc.) was in simultaneous use within the same unit (often on the same soldier) at the same time. . . at least until MOLLE came along and by and large drove the majority of earlier kit out – in the mid-1990s, my personal web set was a mix of all three major generations of LCE, some because Supply didn’t distinguish between them, and some because I felt they met my needs better. These are photos appearing on retailer web pages. The items in this category can be attached to either a belt or to a pack. My belt (see below) has as part of it's marking "LC-2", so it's not clear to me what LC-1 and LC-2 mean, if you know let me know. It may be that the Load Carrying #1 (LC-1) packs can be used with either shoulder straps or the LC-2 pack frame and the LC-2 packs can only be used with the frame. The Medium Pack is used with or without the LC-2 Pack & Cargo Frame. The Large Combat Pack requires use of the frame. Each pack features a large internal pack sack and radio compartment, compression straps, external cargo pockets w/cinching buckles, Velcro® closing top flap with a pocket roomy enough for a 2 or 5 Quart collapsible canteen. Conventional lashing or gear attachment patches are provided. 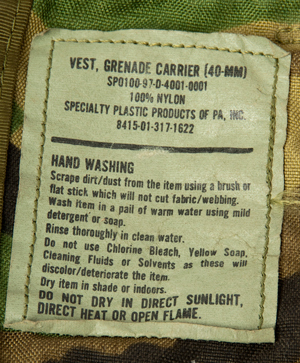 Fabrics are Mil-Spec nylon duck and harness webbing. Military A.L.I.C.E. Ruck Frame (Black) (LC-2 Pack Frame only?) NSN 8465-00-001-6475 ? I'm not sure if this is the correct NSN for the ALICE clip. It can go over an object that's no more than 2 5/16" wide and 3/16" (0.1875") thick. One layer of a ripstop belt is 2 3/16" wide and 0.230" over an eyelet and 0.145 over the material. So you need to install the ALICE clip along the length of the belt where you want it since you can not slide the clip past an eyelet. When opened, like in the photo at the left, there is some spring so you can open up the 3/16" to much more for installing the clip. The shoulder straps on the Field Pack art too bit to allow ALICE items to be attached. I've seen large rubber bands used or other ways to attach stuff. 6605-00-846-7818 Pouch, Lensatic Compass, has a single ALICE clip on back. The W.W. II Pistol belt had eyelets spaced 2 3/8" along the belt and 1 5/8" across the belt for attaching things like a canteen. The canteen had bent brass rod, maybe 1/8" diameter, that could be fitted into a pair of holes, either the top or bottom pair by removing the belt and bending it so the distance between the eyelets was small. Once the belt was straight the item attached could not come off the belt. This modern belt has the same eyelets for backward capability with that old system. Why was the W.W. II belt an LC-1 and the new belt is an LC-2 (or what does LC-1 and LC-2 mean)? One end has a metal hook permanently attached by folding the strap upon itself and sewing. A metal buckle can slide along the length of the strap and can not slide off since the other end of the strap has a stop formed by rolling three turns of material and then sewing together (bottom of photo at left). The strap is 53" long. 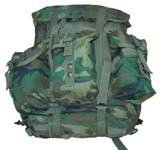 8465-01-025-2637 Field Pack Large - has 6 external pouches, 3 lower large ones and 3 upper smaller ones. 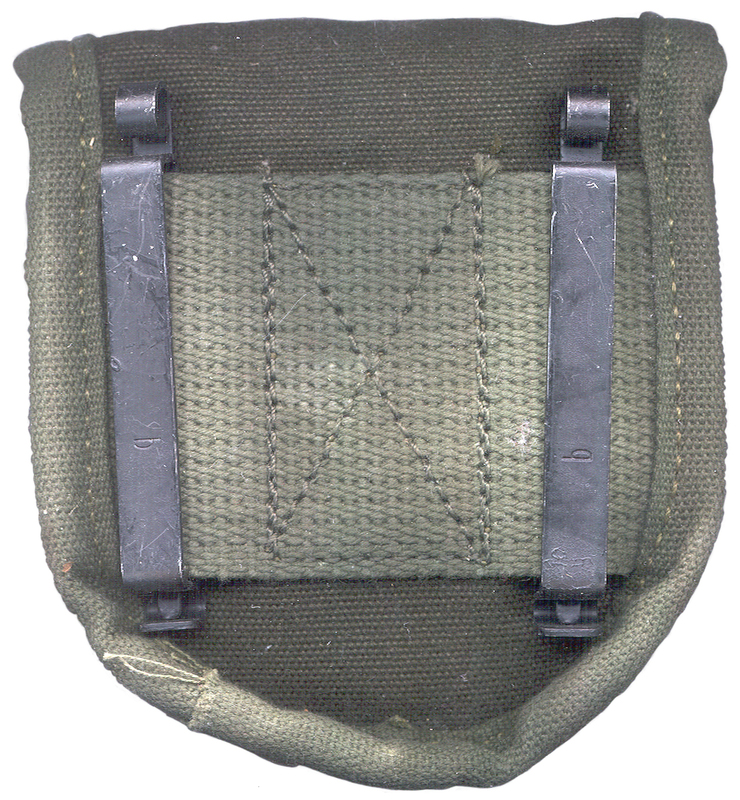 The Waist belt on the above pack frame is marked MOLLE and has what I think are MOLLE straps on the frame side. It holds to the frame with an elastic band. Frame is about 20¼" tall and 12" wide. 8465-01-075-8164 Waist Strap w/Lower Back Pad - Uses the side latch plastic buckle that is different from the pistol belt center latch plastic buckle. The cover strap has been opened for the photo. In use the strap is snapped over the catch. When the strap is unsnapped and pulled up, the catch releases, even under load. The catch does not need to be touched to release the load. Note: two ALICE clips on back. Remove bladder and unscrew cap. Fully extend bladder by blowing into it. Float empty bladder on side, holding neck of bladder with 1/3 to 1/2 of opening under water. Do not totally submerge opening. Slowly submerge bladder as it fills. 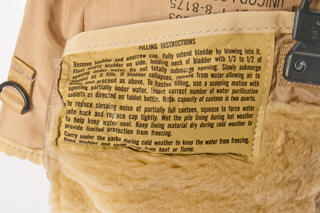 If bladder collapses, remove from water allowing air to enter and proceed as above. To hasten filling, use a scooping motion with opening partially under water. Insert correct number of water purification tablets as directed on tablet bottle. Note: capacity of canteen is two quarts. 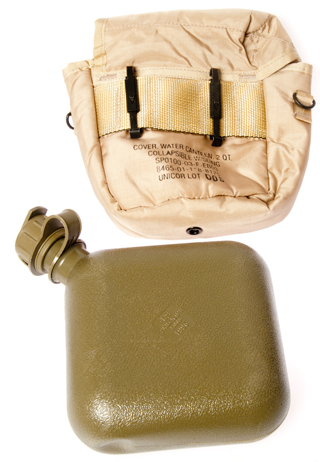 To reduce sloshing noise of partially full canteen, squeeze to force water into neck and replace cap tightly. Wet the pile lining during hot weather to help keep water cool. Keep lining material dry during cold weather to provide limited protection from freezing. 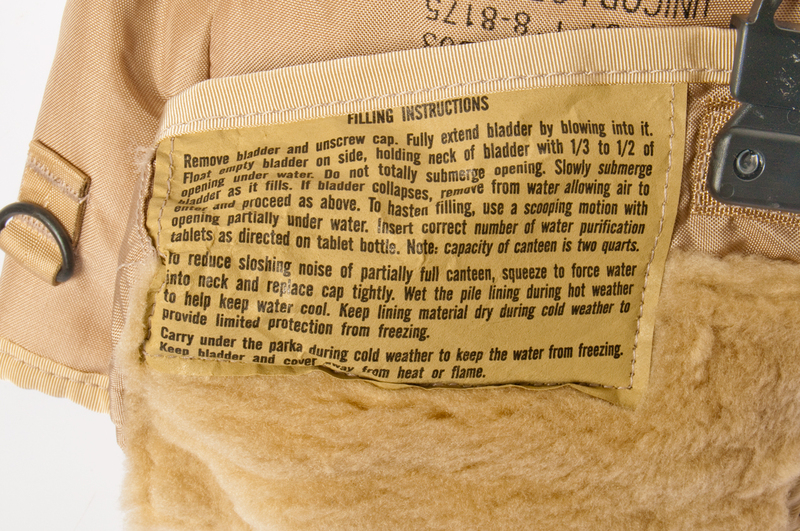 Carry under the parka during cold weather to keep the water from freezing. Keep bladder and cover away from heat or flame. Used with gas mask tube. In folded position, very compact. "<-LUBRICATE". There was dried out white Lubriplate grease in the threads. I cleaned them and used Silicon grease. Note: you must remove bolt to get access. When replacing bolt the shovel must be in the same position otherwise it will not fold up. 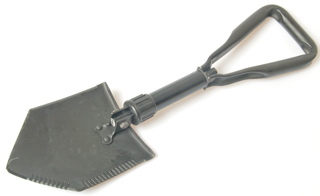 When the nut is tightened against the shovel it also locks the handle joint making the shovel one solid unit. 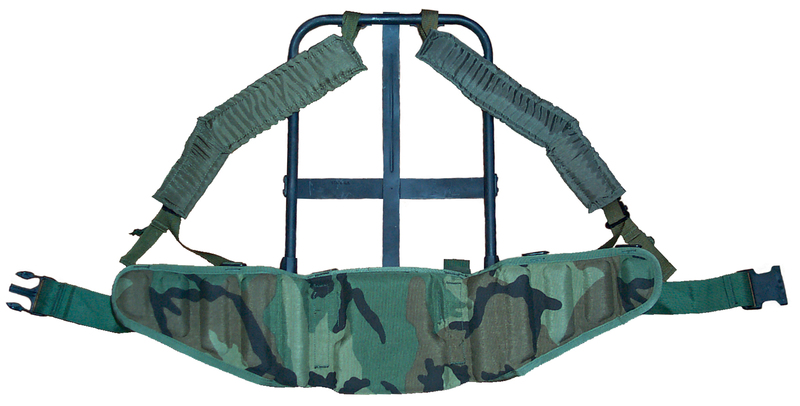 Hook to Hook length adjustable from 28" to 47"
8465-01-253-5335 Field Pack, Camouflage used with the PRC-104 Radio. Has a separator in the top main compartment and has 3 seperate external pouches, each with a buckle & two snap fasteners. of Pack Frame at top. Right photo taken outside in shade. 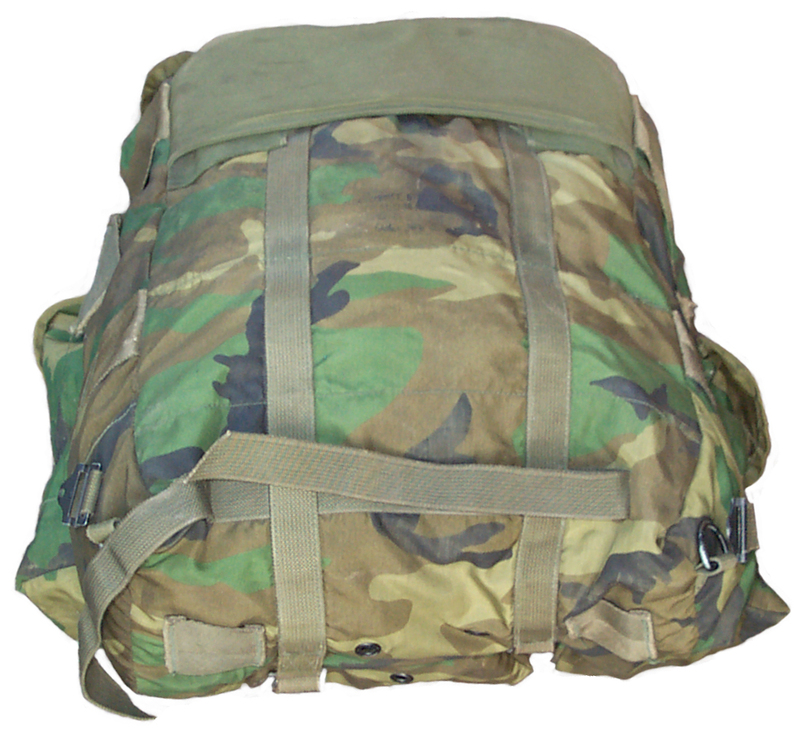 The prior owner of this pack had used a pair of right shoulder straps in the released mode, with the bottom of the lower straps connected to "D" rings down low on each side of the pack thus allowing him to carry the pack using just shoulder straps and no pack frame. Although this was not the intention, the ALICE system provided the flexibility to easily complete this filed expedient setup. The main compartment has a divider that appears to be designed to hold a radio. The PRC-104 fits nicely with either the small or large battery boxes attached. There's a strap and buckle that holds the radio into that packet. 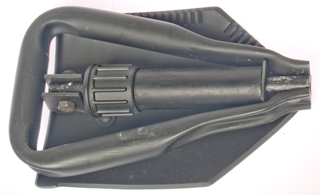 Either way you install the PRC-104 the strap ends up covering the mode and volume controls. If the AUDIO connector it near your right ear, then the handset cord will be convenient for Pedestrian Mobile operation. If the pack is dismounted and the radio used with the pack on the ground then the radio could be installed either way. The main compartment is not too large once a radio is installed. The other compartment is 18" deep, just the right size to hold the AT-271 antenna, a counterpoise wire or other wires. 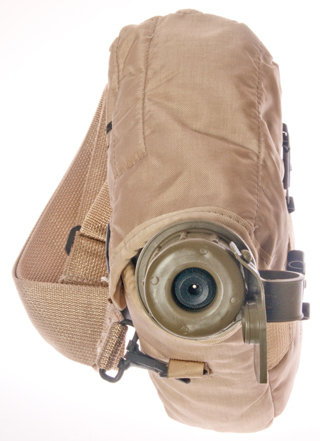 With a PRC-25 or PRC-77 installed in the pocket, the strap covers the frequency display window. A better design would be to use two straps each about 1/3 of the way across to hold the radio, and actually only use the one of them not blocking something. When the Field Pack is hooked over the Pack Frame a Cargo Shelf in the upper position will add support to the radio, taking it's weight off of the pack cloth. This moves the radio up slightly and the pack closes properly. 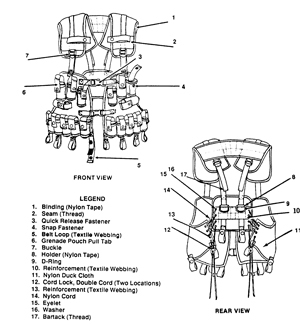 But is not compatible with tying the lower pack straps to the frame. To use the lower pack straps the Cargo Shelf needs to be removed. By using the ALICE Pack and Frame the PRC-25, PRC-77 or PRC-104 can be carried in a more or less concealed way and all the accessories can be carried in the pack, so the CW-502 accessory bag is not needed as when the ST-138 radio carrier is used with the PRC-25 or PRC-77. 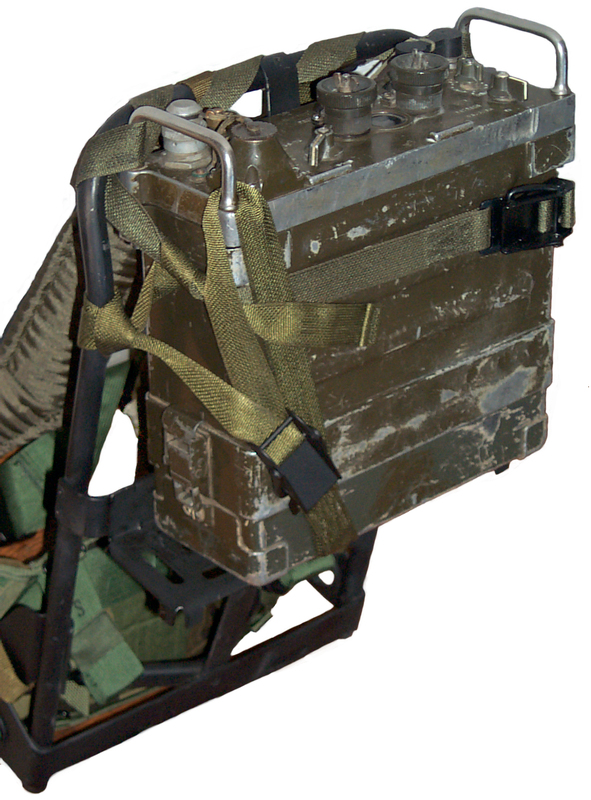 PS Magazine for 1990 issue 451 shows the ALICE Pack Frame as a way to carry the PRC-25 or PRC-77 but does not mention this Camouflage Field Pack or when or why the ST-138 was discontinued. 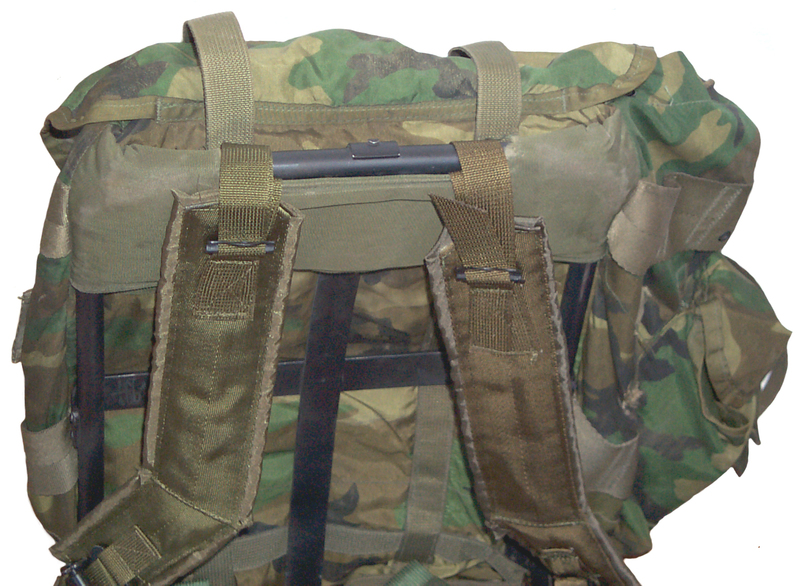 The shoulder straps need to be installed so that they are not trapped under the Medium Field Pack. I.e. 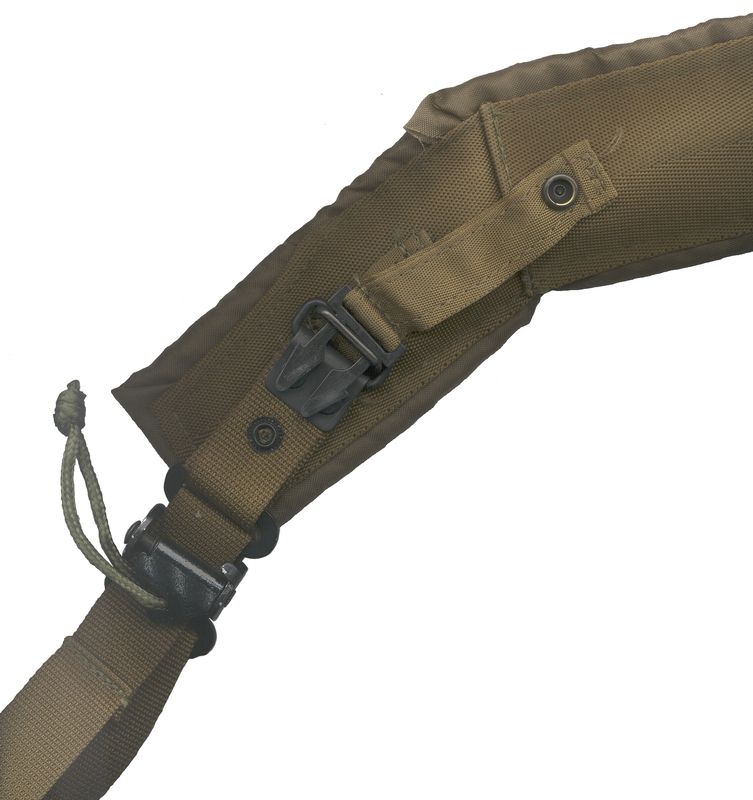 they need to be installed after the Field Pack is slipped over the top of the pack frame. The quick release on the right strap makes it easy to get it through the slit in the top of the pack frame pocket, but the left shoulder strap top strap buckle needs to be undone to get it installed properly. 8465-01-481-4448 Cover, Field Pack, Ca...? They just hook over the flat metal frame straps. If pushed upward they come right off. 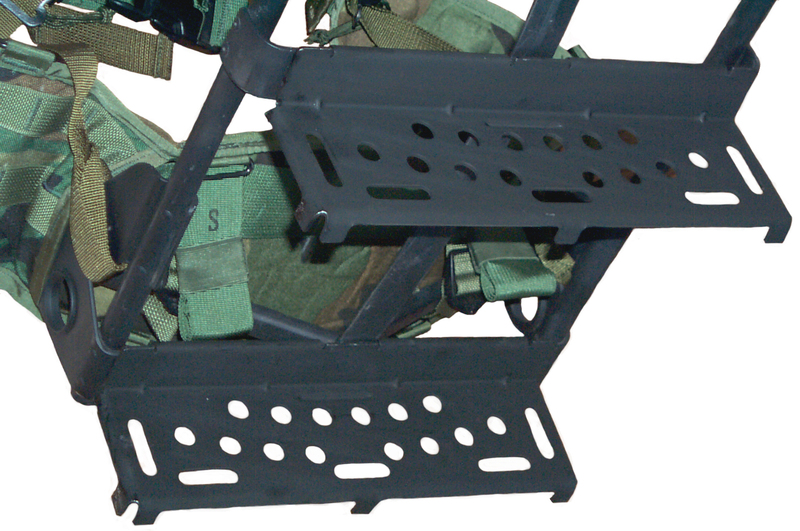 Close up of 2 cargo shelves on pack frame. Top of shelf is 11.5" wide and 3" deep. About 9" from top of bottom shelf to bottom of top shelf. PRC-25 on top cargo shelf held by 2 cargo straps. I used one strap wound around the top pack frame bar and then around the radio after going through the handles. This holds the top part of the radio, but it still can move away from the frame at the bottom and can still move up. A second strap wrapped around the pack frame center vertical metal strap and then across the radio a handle and back to the center metal strap completes this setup and the radio is firmly held in all directions as well as tapping the cargo shelf. Using the top shelf gets the antenna higher and keeps the handset cord shorter than using the bottom shelf. 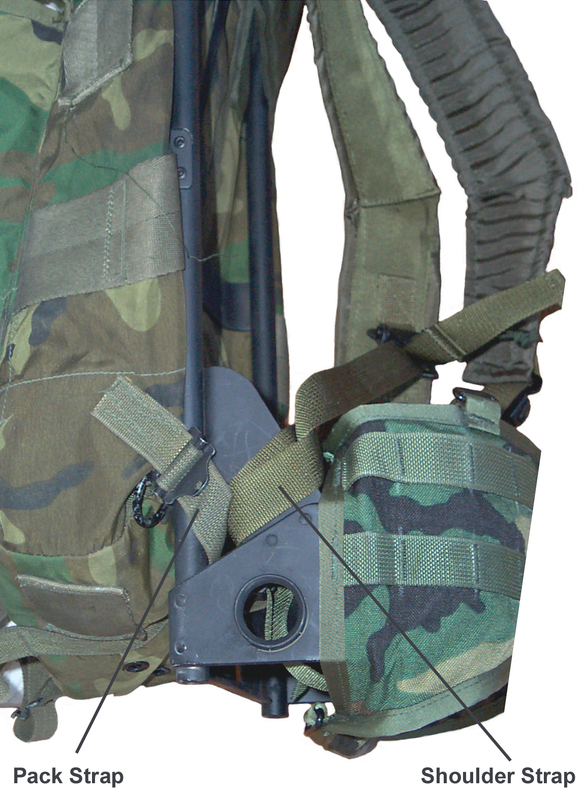 If you have a good way to strap the PRC-25 or PRC-77 to the Pack Frame let me know. AT-984 Fishing Reel long wire antenna comes in a ALICE canvas bag. Radio Pouches for the PRC-68 Family of Squad Radios. which is the Magnavox FSCM or CAGE number and their part number. 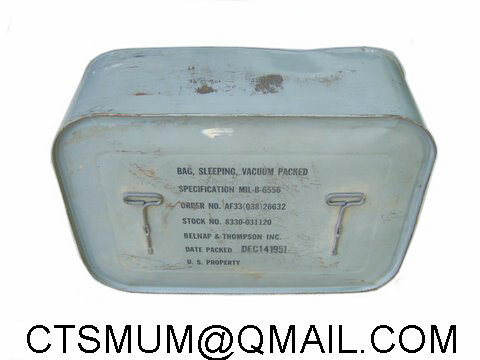 5820-01-322-3477 Radio Carrying Case - Note this is a Radio NSN, not a web gear NSN. It may have been a modification done on the 8465-01-253-5335 Field Pack, Camouflage used with the PRC-104 Radio above. It is also for use with SINCGARS radios. 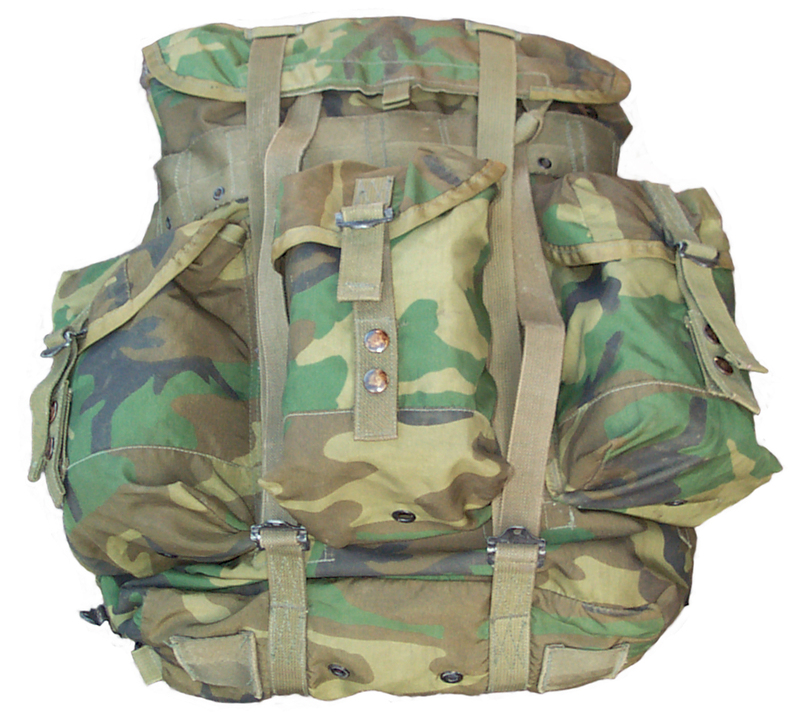 This NSN may be a top level number that includes the pack frame, shelf?, and/or cargo straps. A possible follow on to ALICE but was replaced by MOLLE. 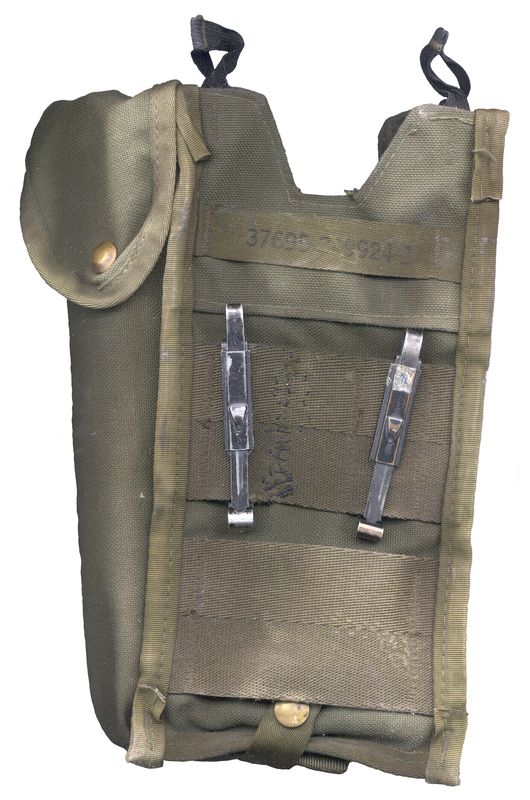 This vest is designed to both carry the 40mm gernades and to also act as suspenders for the standard ALICE belt. It has built-in shoulder pads and a number of snap/velcro loops at the bottom to attach to the belt. One size fits all. 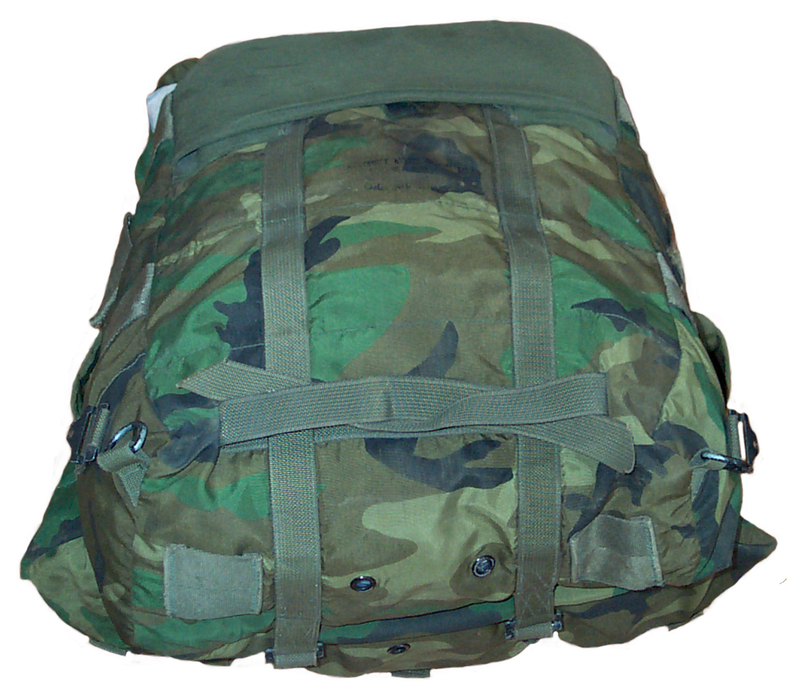 The MOdular Lightweight Load-carryng Equipment system may use a Velcro strap to replace the ALICE Clip, but I have not yet found a good technical description for MOLLE. 4. No money for publishing…money going to fielding new body armor, up-armored vehicles and bullets…. 13 1/2" x 9 1/2" x 5"
packed in some larger (crew) USAF survival kits in the 1950s. They were superseded by the MC-1 bag of the early '60s and only in certain kits with this packaging. All LC-2 parts can be used with LC-1 gear. Belt, Large nsn 8465-01-120-0675 - - - Typo? Belt, Medium NSN 8465-01-120-0674 - - - Typo? The above images and information is from the suppliers below. Camelbak - water container worn on the back with a drinking tube. MOLLE compatible. [an error occurred while processing this directive] This is the time this page has been accessed since since 8 June 2004.